One of the specific areas of real estate law that our Bronx lawyer can help you with is deed transfers. The deed to a property designates who the legal owner is, and in most cases, the person who has their name on the mortgage is the person who is also on the deed. There are some circumstances where transferring the deed to another person could in the best interest of your finances. Should You Consider a Deed Transfer? These are some of the more common circumstances that clients come to us with that require a deed transfer. When there has been a death of a loved one, there are a lot of things you’ll need to think about in the middle of your grief. Not the least of these things is their property holdings. Often, a relative or spouse will pass away with their name still on the deed for a property. In these instances, if there is another name on the deed, ownership will automatically pass to that person. If there is no other name on the deed, you’ll need to go through probate. Once that process is complete, the deed of the property can be transferred to the legal inheritor. Going through a divorce is one of the hardest things many of us will face in our lives. Dealing with joint ownership of the family home is just one of the factors you’ll need to deal with during the process. As a part of a divorce settlement, one person might transfer ownership of the family home to their former partner. They might decide to give up their part of the equity in exchange for other assets, as spousal payment, or simply as a way to quickly end the relationship. In these instances, you’ll need to transfer the property to the other person and get your name off of the deed. You can no longer pay the mortgage. Facing a foreclosure is difficult, stressful, and can leave you feeling like a failure. Some people use a deed transfer as a way to avoid foreclosure. They may find that they can no longer make the payments on their home and choose to do a quitclaim deed on the property to another person. This means they literally quit the claim they had on the property and sign it over to another person. However, this doesn’t mean it ends your obligation on the mortgage, so you’ll need to make sure you understand the implications of signing the deed. Signing a deed doesn’t necessarily require the help of a legal professional. You’ll need to sign in the presence of a notary, but that’s often the only legal requirement. While in some cases, signing a deed can be a straightforward process, in most cases it’s a good idea to seek the help of a real estate lawyer. That’s because signing the deed could have implications that go well beyond the property itself. It can impact your taxes, your financial situation, and the deed transfer might not actually be legal for one reason or another. Consulting with a lawyer can protect your interests and verify that the deed a), can be transferred and b), is being transferred legally. Real estate law is hardly ever uncomplicated; in fact, it can be one of the most complicated areas of the law. That’s why it’s a good idea to hire a real estate lawyer to help guide you through the process and ensure everything is being done correctly. When one of these circumstances comes up, it’s a good idea to ask a Bronx real estate lawyer to walk you through the process. 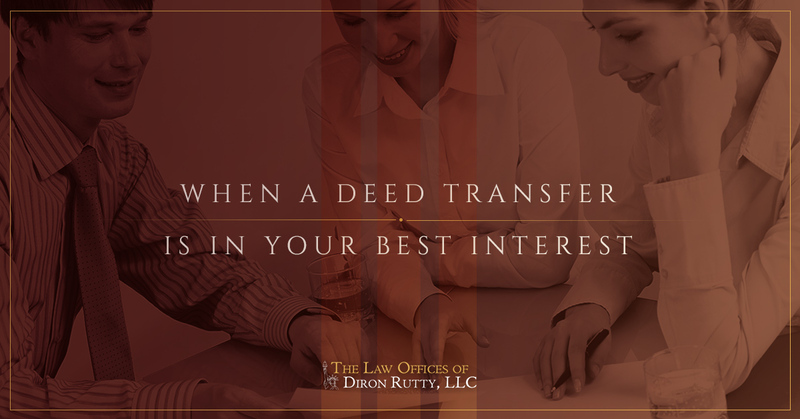 The Law Office of Diron Rutty will make sure that your rights are being protected, the deed transfer is in your best interest, and that you fully understand the implications of the transfer. If you are considering a transfer of a deed, we’d be happy to talk to you first. You can schedule a free consultation with our office by giving us a call or contacting us through our website. We’ll arrange a time for your consultation and help you get the information and answers that you need.